LAKE CITY, FL – IDP's Dennille Decker came to the microphone last night to give the City Council and the attending public an update on the $15 mil Blanche reconstruction. Long a controversial project and the hallmark of former City Manager Wendell Johnson's career, in about 90 days everyone, will know if City Manager Johnson's vision will pay off. LAKE CITY, FL – Tonight in City Hall, the City Council has an extensive agenda with 14 ordinances and 9 resolutions on the docket. The agenda with all supporting information is 406 pages and has not been made available on the internet. Neither has the short version. 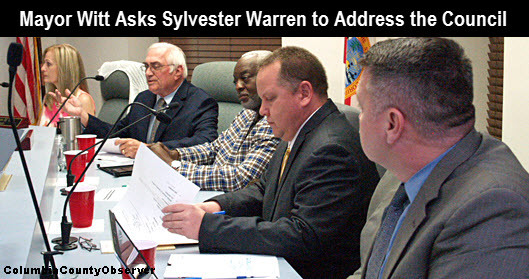 LAKE CITY, FL – After going over the City Council approved rules for addressing the Council and asking all speakers to address their comments to the Council "as a whole..." Mayor Witt invited Lake City resident and community activist Sylvester Warren to the microphone. 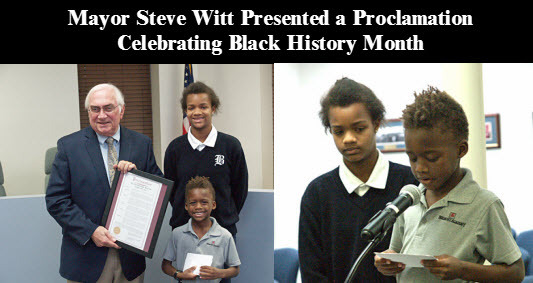 LAKE CITY, FL – Monday night, February 4, 2019, Lake City Mayor Steve Witt, for the first time since January 21, 2014, specifically referenced the City's rules of "Decorum." The rules were brought up matter-of-factly before any speakers were invited to the lectern to address the City Council. 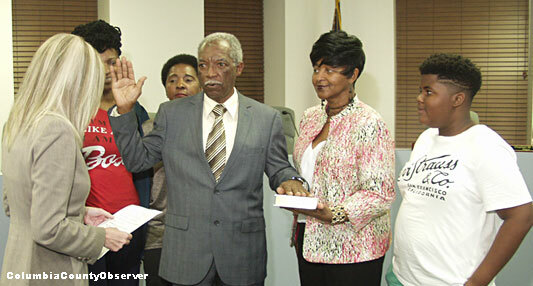 Lake City resident and community activist Sylvester Warren was caught by surprise. City Manager Joe Helfenberger wasn't. Both had a problem abiding by the rules. LAKE CITY, FL – Monday night, December 17, little noticed on the City Council agenda was a $22,000 item which will bring Lake City web design and agenda preparation into the 21st century. City Manager Helfenberger is also working to make the City more transparent. 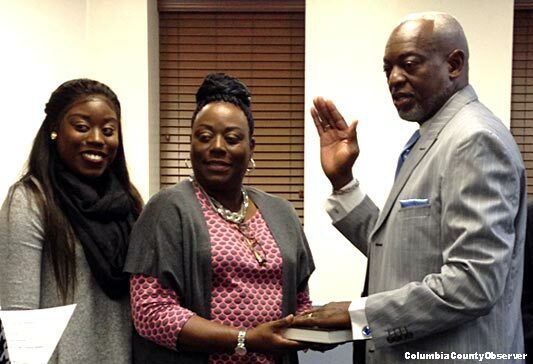 LAKE CITY, FL – Last night in City Hall, City Clerk Audrey Sikes gave City Councilman Eugene Jefferson his 6th oath of office and his wife, Betty Jefferson held the family bible and family members looked on. LAKE CITY, FL – With low non living wage dead end jobs populating Lake City's US 90 corridor like a field of wild mushrooms, local law enforcement has felt the pressure with more traffic and congestion. Last night in City Hall Mayor Witt, recognizing the fact that the City had stopped providing funeral procession escorts "years ago," directed the City Manager to come up with a policy for the City and the Police Department. LAKE CITY, FL – Last night in City Hall, veteran Councilman Eugene Jefferson received the Mayor John Land Years of Service Award from the Florida League of Cities. While I support local news coverage, I share the belief with many of a growing deception of news coverage to advance personal opinion, which if we desired, we would seek individually and not be forced to cough up $1.00 under the guise of news. 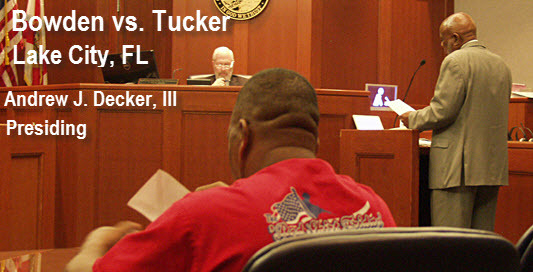 LAKE CITY, FL – Wednesday morning, former Congresswoman Corrine Brown's long time District Supervisor (Jacksonville), Glenel Bowden, dragged VA hospital staffer and Lake City resident Clarence Tucker into the Columbia County/Lake City Circuit Court seeking an injunction to remove Mr. Tucker from the upcoming City election ballot. Mr. Bowden claimed that Mr. Tucker did not live in the district to satisfy the Lake City Charter requirement for one year prior residency for city council candidates. LAKE CITY, FL – Eighteen months ago around midnight, Mayor Steve Witt's car drove itself into Lake DeSoto after he left the Elks Lodge, a well known local hangout for Columbia County's politicians, movers and shakers. He had too much to drink. "I was feeling dizzy because of a new blood pressure medication I was taking and got out of my car to get some air. I didn't take it out of gear and it drove itself into the lake," he said today. Six months later Mayor Witt pleads no contest to a DUI. The story could have ended right there, but Columbia County's mainstream media, the local version of Pravda, had a message to send. LCPD City Manager Investigation: Background Check or Stassi Like Police Overreach? LAKE CITY, FL – The recent search for a city manager in Lake City was generally an unscripted – fly by the seat of your pants – affair. The Lake City City Council was responsible for the search methods and the final methodology of the background check of the applicants. In the civilized world, HR departments and credit reporting agencies perform detailed background checks of finalists. Lake City sent two armed Lake City Police Department (LCPD) plain clothes investigators unannounced into the present and past communities of the two finalists, Joe Helfenberger and Danielle Judd. LAKE CITY, FL – Lake City should have a new City Manager ready to begin on August 1, 2018 if all goes according to plan during Monday evening's City Council meeting. On the agenda is the approval of the contract between Joe Helfenberger and the City. LAKE CITY, FL – Those that have been driving around downtown Lake City may have noticed activity happening on the brick walls of City Hall. These walls are brick façade. They are falling down. LAKE CITY, FL – Thursday's June 28, 2018 special City Council meeting was the Friday morning main topic of Columbia County's mainstream print media, the Pravda of North Florida and the self-proclaimed only Columbia County news source that you can trust, the Lake City Reporter. While there were a few rocky moments, in which the only City Manager candidate left standing and ultimate designee Joe Helfenberger was "cool – calm – and collected," Friday's headline accused Councilmen Jefferson and Hill of "trying to throw up a last-minute roadblock." This was not true. LAKE CITY, FL – Yesterday evening in City Hall, Joe Helfenberger was the "Last Man Left Standing" in the race to fill the City Manager position, vacated when Wendell Johnson turned in his resignation earlier this year and Danielle Judd, who had finished in a dead heat with Mr. Helfenberger, withdrew. LAKE CITY, FL – Beginning at 9 am and ending a little after 6 pm, the City Council soldiered through the five final candidates for the vacated city manager job. The top two finishers, Joseph Helfenberger and Danielle Judd, finished in a dead heat and have been the top two since the first tabulation by the Council. Both candidates are different in style and substance. The final decision will be made at a special meeting on June 19 after the final interviews, which will begin at 1 pm. City Manager Search, Next Up The Interviews – Will the Semifinal 5 Begin With a Clean Slate? LAKE CITY, FL – Wednesday morning beginning at 9:30 am the City Council will be interviewing the five semifinalists who wish to be the next City Manger. The process began with a bumpy start in February, City Manager Search Halted, Job Posting Withdrawn, Council Regroups...; then gained an even keel and faltered again in April, after Councilman Jefferson wasn't prepared with his candidate rankings, City Manager Search Stalls - Starts. City Council in Disarray. Emerg Mtng Called. 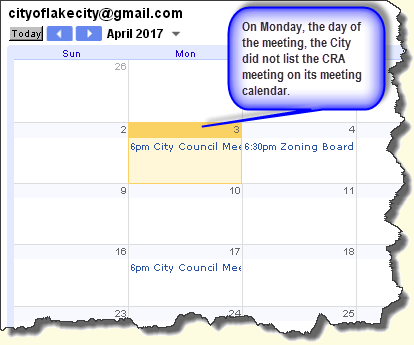 Things were smooth again until City Attorney Fred Koberlein's suggestion that the scheduled interview times, might not be the actual times. LAKE CITY, FL – Mayor Witt got right down to business. He asked if anyone wished to address the Council and seeing none he addressed the Council: "I'm sure everybody received a packet that Ms. Greene prepared. I want to thank her for a lot of hard work puttin' this together and our purpose tonight is to give us a little short list and figure out when and how many we want to interview." 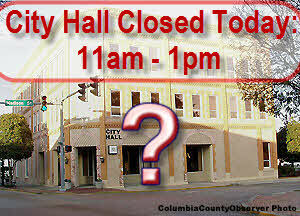 LAKE CITY, FL – Lake City City Hall is shutting down from 11am to 1pm, during lunch time for many who do their business with the City. No one knows who gave the order. Last night, City Councilman Eugene Jefferson thought the building was being shut down for maintenance. It's not. It is being shut down for a publically funded dinner for the City's woman workers, some of whom with their benefits, cost taxpayers over $100k a year. The event is voluntary. City Manager Candidates On Tap in City Hall 6pm Tonight: Who will be interviewed? LAKE CITY, FL – A special meeting has been called for tonight at 6 pm in City Hall to whittle down the list of the 9 city manager semi finalists. By the conclusion of the meeting, the City Council will have decided which candidates to interview. LAKE CITY, FL – Eight years after hiring IBI to develop a master plan for downtown Lake City, the Community Redevelopment Advisory Committee (CRAC) approved the design for an amphitheater/bandshell for Wilson Park in downtown Lake City. 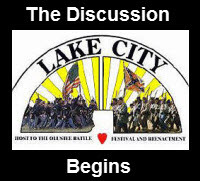 LAKE CITY, FL – Thursday evening was busy in Lake City with both the City Council and the County 5 meeting concurrently for the first time in the decade that this reporter has been covering the two. On the City's emergency-special meeting agenda was the continuation of the new city manager search. 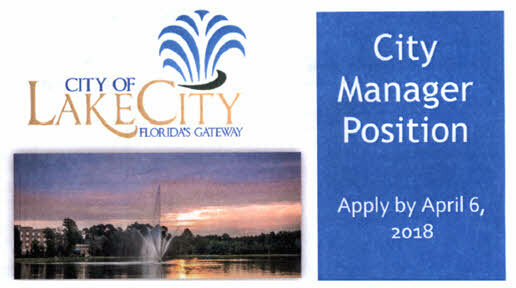 LAKE CITY, FL – Monday night at City Hall had the City Council searching for a way to rank and rate the 54 applicants for the City Manager spot, soon to be vacant with the retirement of Wendell Johnson, who is departing at the end of May. 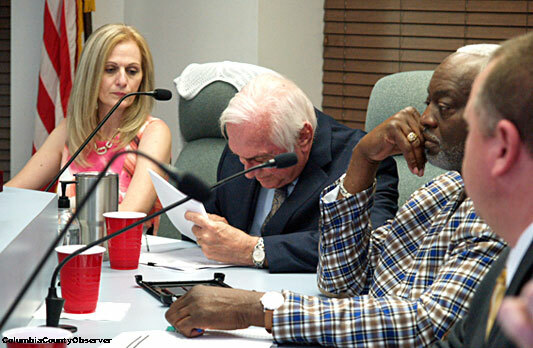 LAKE CITY, FL – A last minute flurry of activity had City Manager resumes flying into Lake City the last two days before the April 6, 12 pm deadline. Through March 14 the City had received 10 resumes. Three weeks later on April 4, the City had received another ten. Between last Wednesday and the Friday deadline, the City had received another 34, two of which were from well known former local officials and one from a present official. LAKE CITY, FL – Monday night in City Hall, Mayor Witt reviewed the City Manager Position papers in an effort to make them ready for prime time. There was input from the two candidates who will be running against incumbent councilman Eugene Jefferson, as well as a couple of members of the public and the council members. LAKE CITY, FL – Thursday afternoon, after receiving the updated City Manager Position advertisement from HR Director Michele Greene, Mayor Witt called for a special meeting on Monday evening, February 26 at 6 pm to review the latest version of the City Manager Position description and request for applicants. LAKE CITY, FL – Last night in City Hall, the topic of the city manager search was not included in the evening's agenda, even though it was scheduled during the last City Council meeting. City Manager Johnson's explanation, given as the meeting was winding down, seemed to fall short [as spoken], "I apologize that under departmental administration I do have an add-on for discussion: that the -- Michele Greene HR Director is gonna' (unintelligible) on the city manager advertisement." LAKE CITY, FL – Following Monday's City Council city manager workshop the regularly scheduled City Council meeting was gaveled to order. Some members of the public were still talking among themselves regarding the city manager search and the revelations by City Manager Johnson regarding the experience required for the new city manager applicant. Between the workshop and the regu#2015lar meeting long time Lake City resident and former Councilman Glenel Bowden asked to be put on the agenda. Mayor Witt granted his request. LAKE CITY, FL – Monday night in City Hall the search for a city manager to replace retiring City Manager Wendell Johnson was halted. The 5 o'clock meeting, billed as a workshop for the council members to discuss what they wanted in a new city manager, fell flat as none of the council members appeared ready for the meeting. A previous job posting, approved by City Manager Johnson, was withdrawn and the Council began regrouping. 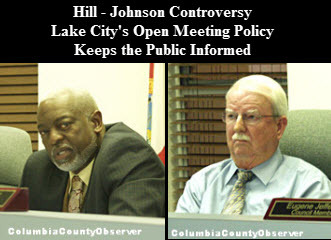 LAKE CITY, FL – Last night in City Hall, City Councilman Jake Hill's continued efforts to oust City Manager Wendell Johnson found no support from the rest of the City Council. 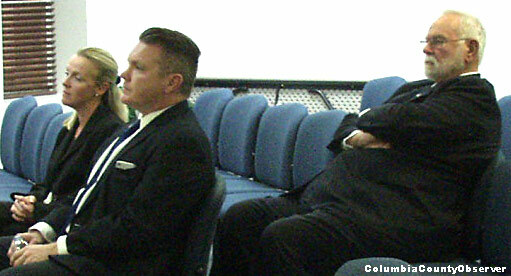 City workers with gripes, who wanted to remain employed, stayed away, as others lined up behind Assistant City Manager Grayson Cason in a well scripted show of support for the nine year City Manager who has had a sometimes turbulent career in Lake City and who has recently taken hits in the press and with the public. LAKE CITY, FL – Monday night, October 2, was a tough night at City Hall. 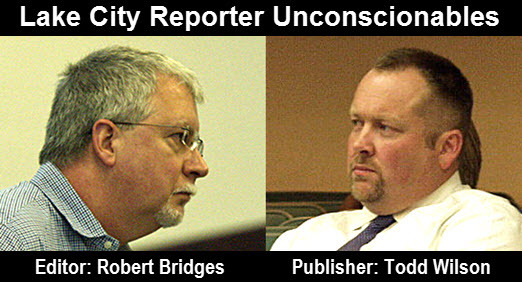 After being criticized by citizens; asked to resign by Councilman Hill; and being skewered by Lake City's mainstream media the day before: being called a "liar by omission" by the paper's editor Robert Bridges, City Manager Wendell Johnson vented. Nothing got out of control and Mayor Steve Witt, as he does with everyone, did not intercede, allowing Mr. Johnson to speak his piece. 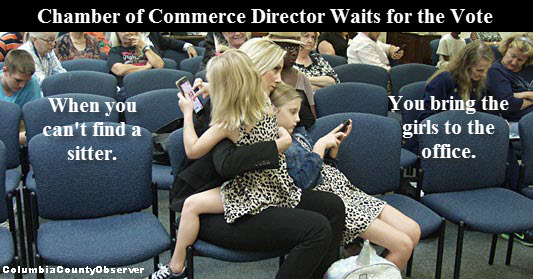 LAKE CITY, FL – Last night in City Hall, Mayor Steve Witt presided over a sometimes contentious meeting while quietly, Chamber of Commerce Director Dennille Decker, after addressing the Council on the Stormwater Fee Ordinance, sat with her two daughters waiting for the vote. 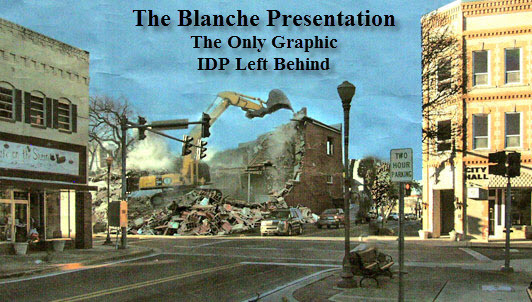 LAKE CITY, FL – On September 5, 2017, after years of secret negotiations by City Manager Wendell Johnson with Integrity Development Partners (IDP) of Georgia, the City Council in a show of no confidence for the fruits of those negotiations, voted to table the Blanche agreement(s) with IDP. The deal to table appeared to have been made before the meeting and there were rumors and talk of other alternative Blanche plans. 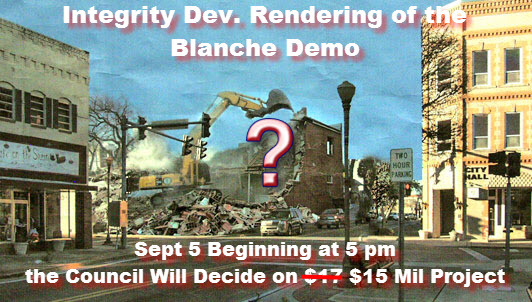 LAKE CITY, FL – Last night in City Hall, the Blanche Project, a deal, which moments after it was hatched over two years ago was made confidential by the developer, Integrity Development Partners (IDP), and was kept confidential by City Manager Johnson for over a year after the confidentiality had apparently lapsed, went back to the drawing board for modifications. Mayor Witt gave the packed house of residents and business people their turn at the microphone to state their case for or against the project, before the deal was tabled in a deal that was cut before the meeting. LAKE CITY, FL – On Sunday, August 27, 2017, Lake City's mainstream media and daily newspaper of record, the Lake City Reporter (LCR) published, what it called, a "Special Report." It followed up on its Special Report with an opinion piece and an article "Blanche docs to be released." Both the opinion and the article were off the mark. LAKE CITY, FL – On Sunday, August 27, 2017, Lake City's mainstream media and daily newspaper of record, the Lake City Reporter (LCR) published, what it called, a "Special Report." The lead off piece was an editorial titled "The Blanche: A failed experiment." 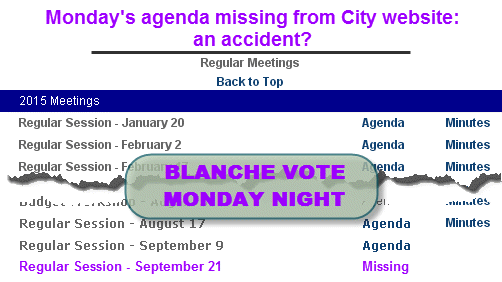 While the paper's newly found sentiment is one shared by mostly everybody - everywhere, except four of the five people on the City Council, the Blanche Project has not failed yet. Only time will tell, should the City Council approve the final agreements. The LCR's special report has given a new headline to an old article to make it seem like it was against the project before it really was. Blanche Update: Lease Cost Up $1.7 Million, City Manager Johnson, "That's not unusual"
LAKE CITY, FL – On August 7, 2017, City Manager Johnson gave no hint to the City Council or the public that the cost to move City Hall across the street, to a space 2 1/2 times its present space in City Hall, was going to cost an additional $1.7 mil. The next evening, August 8, at the Community Redevelopment Advisory Committee (CRAC) meeting, Mr. Johnson arrived late. CRAC Chairperson, Councilwoman Melinda Moses asked Mr. Johnson for an update. It was then, with no members of the public in attendance, that the City Manager revealed the increased lease cost. LAKE CITY, FL – Recently, Lake City has become a Mecca of non-living wage jobs, chicken wings, fast food emporiums, auto dealerships, shopping malls and Internet Cafes. The Lake City/Columbia County Chamber of Commerce has been leading the fight against Internet cafes – one opened very close to the Chamber's Hdq. -- and caught a friendly ear with City officials. On August 8, 2017, newly arrived City Building Department chief, Rod Hoefert, gave the Community Redevelopment Advisory Board an update on the City's fight against Internet Cafes. 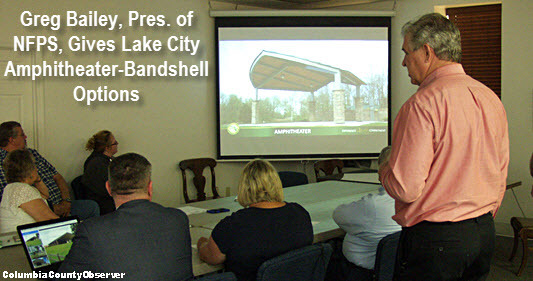 LAKE CITY, FL – The Lake City Reporter's Sunday, May 21 announcement that City Council members will be attending a special 'Chamber Only' meeting in the City's Council Chambers about the proposed implementation of stormwater fees had City Manager Johnson scrambling to walk back the announcement by the LCR. 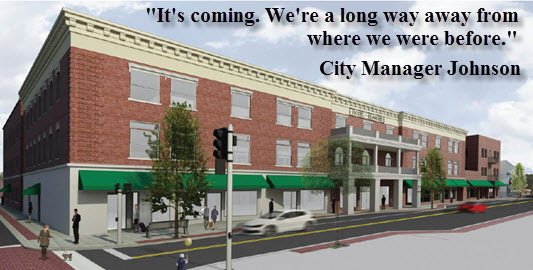 LAKE CITY, FL – Yesterday's Lake City mainstream print media article, "Blanche Hotel project 'will close'," had County Manager Ben Scott blasting off a polite email to City Manager Wendell Johnson letting him know the County is not interested in leasing City Hall. For years, City Manager Johnson and his private partners, Integrity Development Partners (IDP), have been telling everyone the construction/renovation of Lake City's Blanche Hotel is just around the corner. Unequal Opportunity for Big Money CRA Grants - Councilman Jake Hill Votes "No"
LAKE CITY, FL – On Monday night, April 17, back before the Community Redevelopment Authority (the City Council) was the "Façade Grant Incentive" for Double Eagle, LLC, which was tabled on April 3 because of questionable public notice. Lake City CRA Tables $45,000 Facade Grant Request. Mayor Witt gave a brief explanation before the item was put back on the table. LAKE CITY, FL – Last night, Lake City's Community Redevelopment Agency (CRA) revisited the April 10 tabled $45,000 request of the recently incorporated Double Eagle Investors, LLC. According to City Manager Wendell Johnson's report to the CRA, the request was for a "Façade Grant Incentive," which he morphed into a "Construction Incentive Grant." According to information received earlier today through a public record request, the City Manager's Office has no application, program or policy, and no resolution or ordinance pertaining to Construction Incentive Grants. LAKE CITY, FL – On Monday, April 3, 2017, the Lake City Community Redevelopment Agency (CRA) tabled a request from a newly formed business, Double Eagle Investors, LLC, for a $45,000 façade grant application. Problematic were the following: the meeting was not adequately noticed; the grant application was not included with the back-up material for the City Council; the minutes of the Community Redevelopment Advisory Committee (CRAC) which may have recommended the approval of the $45,000 grant were not available; the grant application was not available; the announcement of the CRA April 3 meeting was not posted to the Lake City event calendar until a day after the meeting, on April 4. 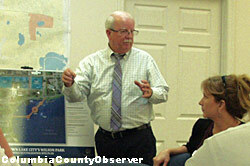 COLUMBIA COUNTY/LAKE CITY, FL – On Tuesday, February 21, the Lake City, City Council met. On its docket was an item regarding the Jack Berry Hwy, technically known by the state as Lake Shore Boulevard, or the East Access Road. Beginning in 2012, the project was driven quickly into the shadows by City Manager Wendell Johnson, who claimed that if your reporter attended the meetings they wouldn't go smoothly. County Commissioner Ronald Williams also worked to keep these meetings in the dark, never reporting back to the County Commission. COLUMBIA COUNTY/LAKE CITY, FL – Last night, after hearing from the public and all City Council members except Councilman Eugene Jefferson, the City Council tabled the consideration of its medicinal marijuana dispensary moratorium. Councilwoman Melinda Moses told the Council, "I need more information." The Mayor and the rest of the Council members agreed. COLUMBIA COUNTY/LAKE CITY, FL – On December 1, 2016, ignoring the will of the people, who three weeks earlier voted to approve Constitutional Amendment 2, the Columbia County 5 passed a never-ending moratorium on the sale of medical marijuana in the unincorporated areas of the County. On Monday night at 6 pm, the City Council is scheduled to vote to approve its own medical marijuana moratorium for the next nine months. LAKE CITY, FL – Last night, Mayor Steve Witt began the City Council logo discussion: "I think this is something the City needs to get out there and get some feedback. This is for discussion tonight. It is not necessarily to do anything permanent." Councilwoman Moses didn't agree: "I love this. It's simple. It's our fountain that everybody can relate to. I really don't know why we're waiting. If anybody likes it as well, why we wouldn't go ahead?" 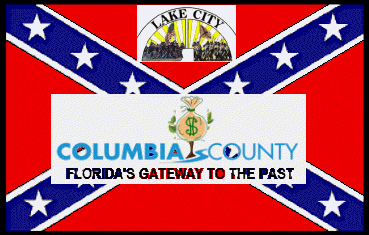 LAKE CITY, FL – After all the discussion of the Lake City logo during the last half of 2015, the future of the old Lake City logo, which shows the Confederate Battle Flag went into hibernation. Mysteriously, without any public discussion and nowhere in the City minutes a new City Logo mysteriously appeared. In its agenda for tonight's City Council meeting, Mayor Steve Witt is asking the City Council to consider "adopting Interim City Logo as the new City Logo." There are no pictures of the new or old logo in the City's agenda material. LAKE CITY, FL – After a 4 year absence beginning in 2012, former city councilman Jake Hill was reelected in August to the City Council. Last night in the council chambers, City Clerk Audrey Sikes gave Mr. Hill the Oath of Office with his wife Deborah and daughter Ba-Brea by his side. LAKE CITY, FL – City Manager Wendell Johnson has dropped the ball once again, listing the incorrect time on the City's web meeting calendar for tonight's City Council meeting. Tonight's meeting, according the meeting agenda and the announcement last Thursday at the Utility Committee, is set to begin at 6 pm. The City web calendar has the meeting beginning an hour later, when at which time, it would be over. LAKE CITY, FL – On Tuesday night, October11, the Community Redevelopment Advisory Committee (CRAC) met to discuss playgrounds and playground equipment in Wilson Park. As the 30 minute meeting was wrapping up, City Manager Johnson gave a three minute update on the $15,000,000+ Blanche project. LKE CITY, FL – City Manager Wendell Johnson prides himself on being an expert on many facets of municipal government. That appears to be one of the reasons the City Council hired him in June 2009. Seven years after being hired, City Manager Johnson has been consistently unsuccessful in keeping the public advised of its meetings or giving them timely access to meeting material. 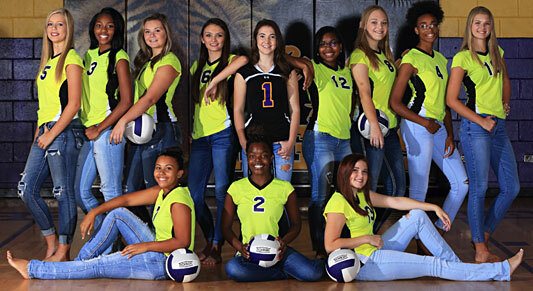 COLUMBIA COUNTY/LAKE CITY, FL – Thursday night the 6th annual Columbia vs. Suwannee High girls volleyball game known as the “Dig Pink" is set to begin serving up the balls at 5:30 pm in support of Breast Cancer Awareness Month. 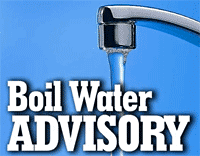 COLUMBIA COUNTY/LAKE CITY, FL – According to the Columbia County School District's Brandi Keen, a broken water main has caused the City to issue a utility wide Boil Notice. An email sent from Ms. Keen reads in part: "The City of Lake City confirmed a Utility Wide Boil Water notice because of a broken water mainline on Brookside and US Highway 90. Students should NOT use the public water for drinking or hand-washing!" COLUMBIA COUNTY, FL During and following the recent primary elections County Commission candidate B. Coker, City Council incumbent candidate Zack Paulk, and City Mayor candidate Audré Washington had questions about the election process in Columbia County and what went on during the meetings of the County Canvassing Board. They claimed they were denied appropriate access to the records and meetings of the Canvassing Board and took their case to court. New City Atny Fred Koberlein: What Did He Say? LAKE CITY, FL – Last night in City Hall an era came to an end. After six decades as City Attorney, a contract for a new City Attorney for Lake City was approved by the Council. Fred Koberlein, Jr., one of the three finalists for the position, had his contract approved without comment, almost. LAKE CITY, FL – On August 31, 2016, Lake City had a special meeting to interview three finalists for the position of City of Lake City, City Attorney. The position was being vacated after more than five decades of service by the legendary and longest sitting City Attorney in America, Herbert Darby. Florida law requires the interviews to be recorded. 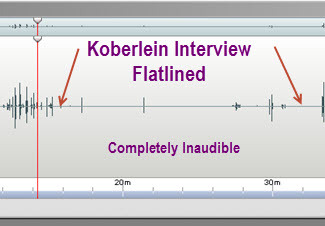 The recordings of the applicants are completely inaudible. 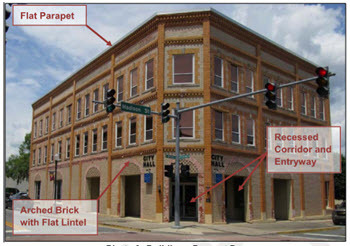 LAKE CITY, FL – Last night in City Hall, Rhett Holmes, president of IDP Housing, the real-estate/construction group responsible for the financing, design, and future construction of what has become known as just the "Blanche," Lake City's downtown turn-of-the century Blanche Hotel renovation, told the Community Redevelopment Advisory Board (CRAC), "I know of no reason why this deal will not proceed." Mr. Holmes blamed "IRS guidance issues" for the delays in completing the agreement between the City and IDP, which will allow the construction to begin. LAKE CITY, FL – Last night the City Council followed in the footsteps of Columbia County and went for the hometown team. Rather than go outside the City/County limits to fill the important, soon to be vacant city slot, that of retiring City Attorney and legal legend, Herbert Darby, the Council decided on a hometown attorney. After an hour and a half of interviews, the Koberlein law firm was ranked number one. City Dropping the Ball: "That's the way it goes"
LAKE CITY, FL – City Manager Wendell Johnson is responsible for the day-to-day operation of Lake City. The City Manager's Office is responsible for preparing City Council agendas and forwarding them to the City Clerk for distribution. The City Manager is also responsible for seeing that the City's calendar is kept up-to-date and has the overall responsibility of scheduling meetings so they are not in conflict with those of other jurisdictions in Columbia County. Lately, City Manager Johnson and the City Council have been dropping the ball. COLUMBIA COUNTY/LAKE CITY, FL – Monday at Governor Scott's Lake Shore Hospital board meeting, none of the Governor's Board members had a single question about the recent deforestation at the back of the Authority owned hospital on Lake Desoto, except Bd. Member Janet Creel. On Tuesday, the Lake City Community Redevelopment Advisory Board met. The comments at that meeting were attention grabbers, especially that of City Councilwoman Melinda Moses who said she was satisfied with the new look. LAKE CITY, FL – Last night the Lake City, City Council approved an open-ended Development Agreement with Hutton Gleason Place LC, LLC, a business registered with the state a little more than 3 weeks ago. The project will develop the old K-Mart shopping center on U.S. 90. City Manager Johnson Brings Clarity to Lake DeSoto Trees and the "Jack Berry Highway"
LAKE CITY, FL – During last night's City Council meeting, City Manager Wendell Johnson brought some clarity to two projects that involve the Lake Shore Hospital Authority and are occurring within the City limits: the clear cutting of the trees on the south side of the Lake Shore Hospital and the relationship of the proposed "Jack Berry Highway" to those trees. 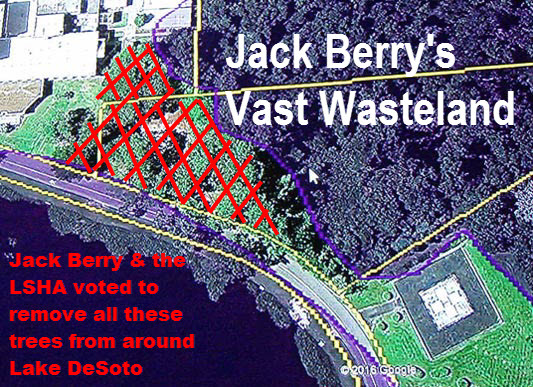 COLUMBIA COUNTY, FL – On Monday night, Jackson P. "Jack" Berry and the LSHA voted to clear cut one of the most beautiful areas of trees around Lake DeSoto, saving just a handful of palm trees. The Hospital Authority leases the land to Community Health Systems (CHS). It is not clear if CHS is going to give Berry clear-cutting permission. The park is in the African American Community. Governor Scott's Lake Shore Hospital Authority Board is all white. Former City Councilman, Jake Hill, told the Observer, "It would have been nice if someone asked us about cutting down the trees in our community." LAKE CITY, FL – Last night in City Hall, Wendell Johnson's Wilson Park/Darby Pavilion/Lake DeSoto plan came to fruition as the Community Redevelopment Authority (CRA) gave its stamp of approval on a $1,635,307 cost estimate by one of the City's contract engineers, Tetra Tech. There remain two pieces of property in the Project area that have not been purchased, both of which impact the proposed renovation plan. LAKE CITY, FL – On Tuesday night, December 8, the Community Redevelopment Advisory Committee met for the fourth time since March 3, 2015, to discuss the Lake DeSoto Waterfront and Wilson Park Recreation Area Redevelopment Project. Along with the top-secret Blanche Project, City Manager Johnson and the City Council are hinging the future of downtown Lake City on these two projects. The Landscape Architect and the Project Engineer did not attend. However, it was made clear that they previously met with Councilwoman Moses, Mr. Johnson, and others behind closed doors before coming up with their latest plan. LAKE CITY, FL – On Tuesday night, December 8, the Community Redevelopment Advisory Committee (CRAC) met for the fourth time since March 3, when the City Council passed Ordinance No. 2015-2054. The ordinance gave the City authority to issue a redevelopment note not to exceed $1.2 million to develop/redevelop the Lake De Soto waterfront and Wilson Park. Most of design work was done behind closed doors by City Manager Johnson and his staff in conjunction with what appears to be two hand-picked consultants. According to City Manager Johnson, the public will be able to weigh in after the final plan is complete and ready for presentation early next year. 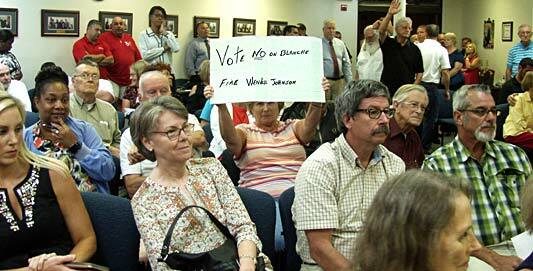 LAKE CITY, FL – Last night in City Hall, City Manager Wendell Johnson backed down, again. 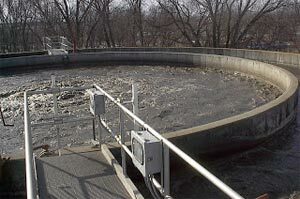 In October, Mr. Johnson brought to the Utility Committee a proposal to privatize the operation of the City's wastewater treatment plant (sewer plant). Unhappy City workers came out in force. Mr. Johnson backed down and tabled sending out a Request for Proposals to privatize the City worker's jobs until last night, when the committee tabled the City Manager's proposal, again. 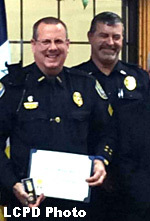 LAKE CITY, FL – Recently, Sergeant Marshall Sova was recognized for exceptional service. On the morning of October 10th, 2015, the Lake City Police Department responded to a residence on SW Jaguar Drive for a report of a shooting. The shooting turned out to be a double homicide. There was a third gunshot victim. Will the Public Be Shutout Again? LAKE CITY, FL – Carried over from October's Community Redevelopment Advisory Committee (CRAC) meeting, City consultants Burl "Bo" Reardon of Tetra Tech and Timothy Green of Green Consulting Group arrived at the CRAC with poster boards showing the areas around Lake DeSoto under discussion. 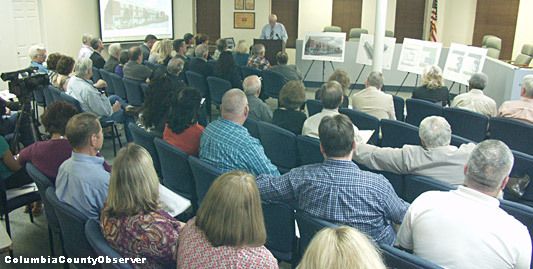 The City set up the meeting so that the renderings were visible only to the committee members. Once again, City Manager Johnson was at times, barely audible. LAKE CITY, FL – After 40 minutes of discussion about privatizing the operation of the City's wastewater treatment plants, City Manager Johnson backed down and moved to table his request until December to publish a Request for Proposals (RFP) to privatize the operation of Lake City's wastewater treatment plants. However, the City Utility appears to be trouble. Moments before the motion was tabled, Utility Director Steve Roberts told the committee, "We need to look at this because we have no capital. We have dipped into our reserves the last two years and we simply do not have the money." LAKE CITY, FL – In a maneuver designed to gut the City's waste water (sewer) utility workers from the City payroll, City Manager Johnson, along with the City Council, gutted and packed the Utility Advisory Committee. Now the Committee is looking into privatizing the City utility worker's jobs. The Utility Committee discussion begins at 5:30 pm tonight. 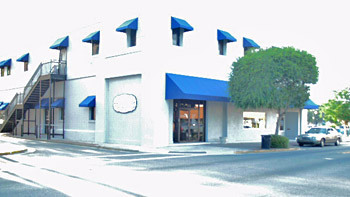 LAKE CITY, FL – On September 21, 2015, one week ago yesterday, the City Council, after months of backroom discussions with City Manager Wendell Johnson, approved entering into an agreement with Integrity Development Partners (IDP) and the newly incorporated Blanche Hotel Redevelopment, both LLC's, located at the same address in Valdosta, GA. The city of Lake City is now on the hook for millions, in a deal in which the contracts and amendments are still up in the air. LAKE CITY, FL – City Manager Wendell Johnson is not bashful about doing end runs around Florida's Sunshine and Public Record laws. He has been working since July with the City Council to secure his legacy with the $20 Mil Blanche Renovation Project. Details have been kept under wraps. If the City and the developer did not correspond before July 15, as is the City Manager's claim, how did they modify and receive the agreement which was headed to the City's Attorney's office on July 15? LAKE CITY, FL – Taking a page from Gov. Scott's Lake Shore Hospital Authority's Jackson P. "Jack" Berry, City Manager Wendell Johnson failed to post the City agenda on the City's website for Monday's scheduled meeting. It was only after the Observer pressed the City that the City Manager finally saw to it that the agenda was posted – at approximately 10:45 this morning (after the Observer's initial news post at 10:35am). The agenda was supposed to have been posted Friday and then last night. 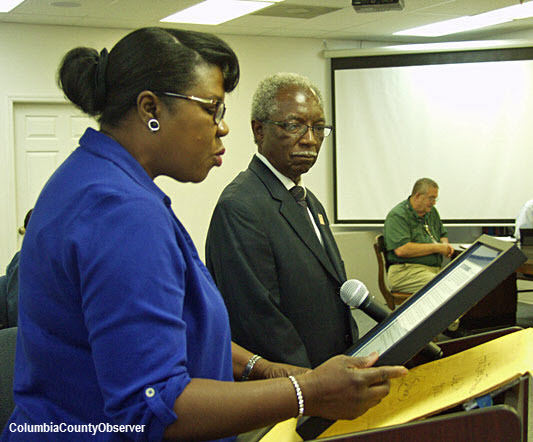 LAKE CITY, FL – 14 years after City Councilman Eugene Jefferson moved to accept the present Lake City logo, a logo which added the Confederate Battle Flag and the American flag to the top half of the City logo, he seconded Councilman Zack Paulk's not unexpected motion to retire "the seal and develop another seal." Before the vote, James Shillinglaw of the Museum of Southern History, excused himself from the meeting, sharing with the City Council what many people in the audience came to articulate, "Southern lives matter – Southern lives matter." Assistant Chief Butler politely escorted him from the Council Chambers. LAKE CITY, FL – For weeks, folks in and around Lake City have been waiting for the City Council to step up to the plate and address the City seal, which includes the Confederate Battle Flag . For a month after the tragic murders in South Carolina, there were rumors circulating of an inside, backroom deal to just remove the flag. The Council did nothing. Finally, on July 20, City residents, Glynell Presley and Bruce Borders, began the conversation. Lake City Reporter Gets It Wrong on the Stars & Bars: What was it thinking? COLUMBIA COUNTY/LAKE CITY, FL – Lake City's "hometown" newspaper has been around a long time. It claims since 1874. 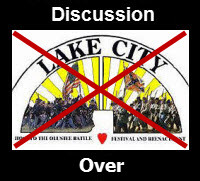 The paper's reporting of Monday night's unscheduled remarks concerning the Stars & Bars on the Lake City logo can only lead the inquiring mind to wonder: What was it thinking? Mayor Witt, "I don't want a knee jerk reaction"
LAKE CITY, FL – Last night in City Hall, folks from all sides of the Lake City Stars & Bars City logo issue addressed the City Council. While not on the agenda, Mayor Witt asked for comments from anyone who wished to contribute to the conversation. LAKE CITY, FL – At the conclusion of last night's City Council meeting an ill wind blew into Florida's legendary Lake City, not unlike the one in March of 2001, when the City Council decided to mug the public at the12th hour and agreed to change the City Logo without any advance notice. It is not clear if anyone in the City ever thought to save the audio of that meeting, which was voluntarily destroyed in March of 2006. Today, with the help of the "hometown" newspaper, the Lake City Reporter, history was rewritten to make stone silent City Manager Wendell Johnson and a stone silent City Council look like they did something that they hadn't. LAKE CITY, FL – Last night in City Hall, Bruce Borders (left) and Glynnell Presley presented their views on the Lake City Logo and its inclusion of the Confederate Battle flag. Lifetime Lake City resident Glynnell Presley, moved by the recent events in South Carolina, appeared before the City Council and asked that the logo depicting the Confederate Battle Flag be removed from City property. Lifetime resident Bruce Borders said the logo should stay as it is. Mr. Borders, also referring to the events in SC told the Council, "This guy was a sick guy – a sicko. That Confederate flag did not cause him to kill nine people." LAKE CITY, FL – Last night, the City Council was required by Florida's Truth in Millage Law (TRIM) to set the maximum City tax rate for the Fiscal Year 2016 budget year. That's next year's budget year which begins on October 1, 2015, and ends September 31, 2016. In order to keep City revenue the same (rolled back rate), the City approved a preliminary rate of $4.0444 per $1,000 of assessed value, up from last years $3.9751, representing an increase of 6.93 cents per $1,000. In plain English, a house valued by the Property Appraiser for $100,000 would pay an additional $6.93 on next year's City tax bill. LAKE CITY/COLUMBIA COUNTY, FL – To some, the Stars and Bars represents: secession from the United States of America, war, destruction, killing, maiming, father against son, brother against brother, family against family, hate, the right to own human beings as property (slavery), Jim Crow. Lake City Tries Again for $750,000 Parking Lot Grant: Will the 4th Time Be a Charm? LAKE CITY, FL – This past Monday night, June 15, 2015, the City Council approved the fourth Community Development Block Grant application for a $750,000 one-half acre downtown parking lot, half of which is already there. The only Councilmember who seemed to have any idea of what was going on was veteran councilman George Ward. The grant, if awarded by the Department of Economic Opportunity (DEO), will be funded by the American People and includes $73,000 for the parking lot plans and $60,000 for grant administration. LAKE CITY, FL – On Wednesday, June 17, 2015, the Lake City Police Department was notified that a bomb threat had been received by Ameris Bank. According to the complaint, a disgruntled customer had contacted Ameris Bank’s customer service line and threatened to blow up the Lake City and Live Oak branches. According to the LCP, "During an interview, Ruzzo stated, "'I was upset and told them I would blow the place up.'" LAKE CITY, FL – At 4 o'clock on Wednesday afternoon the staff of the Columbia County Department of Health, located in downtown Lake City, smelled smoke. At 4:01 a code red was called and the fire alarm was pulled. By 4:03 everyone was evacuated from the building and the Lake City Fire Department arrived to put the fire out. Mark Lander, DOH Director said, "It was amazing. The fire department was here in two minutes." COLUMBIA COUNTY, FL – City Manager Wendell Johnson's Blanche Hotel Redevelopment Project took a hit last night when the County 5 voted 3-2 not to remove $1,000,000 from its reserves and loan/grant Integrity Development Partners (IDP) a million dollars interest-free. A convoluted financial arrangement would have had Lake City make a good faith guarantee of the IDP loan. The project is not dead. 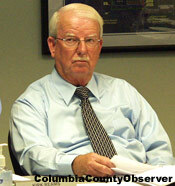 On May 9, City Manager Johnson told the County 5, "The City don't want a loan from the County. I'm sayin' that to ya because we don't need the loan from the County. We got the money to loan ourself..."
The Blanche – The County Million $ – The County 5 Tonight: "To be or not to be? That is the question"
COLUMBIA COUNTY, FL – The Blanche Hotel Renovation Project is back on the County 5 docket tonight. The issue The 5 may decide is a simple one: will the County 5 be in favor of giving/lending Integrity Development Partners (IDP) $1,000,000 from the County's reserves? 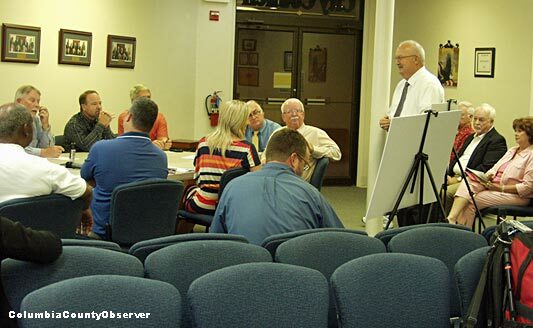 The County 5's May 7 meeting ended in confusion. One of the major issues brought up by County Attorney Joel Foreman was the need to get a written opinion from the County Auditor and financial advisor, Richard Powell, regarding the legality of an interest free loan to Lake City. Mr. Foreman never got that opinion. LAKE CITY/COLUMBIA COUNTY, FL – Last night in City Hall, the Lake Shore Hospital Authority land-buying spree, orchestrated by Jackson P. “Jack” Berry in the mid-2000’s, paid off for Lake City, when the City Council approved an Interlocal Agreement, previously approved by the Authority, giving a city block of Hospital Authority land to Lake City. The property, including legal fees, demolition, and other expenses appears to have cost the Authority tax-payers over $700,000. Now worth $34,000, it will be turned into a parking lot. Blanche Redevelopment Confusion: Com. Nash, "Everybody should get in a room and air it out"
COLUMBIA COUNTY, FL – The byword for Lake City, City Manager Wendell Johnson's Blanche Redevelopment Project has been "confusion." City Manager Johnson's secrecy throughout the project and Columbia County's Hapsburg-like rule has done nothing to clear the air. At midday yesterday, County Commissioner, Sylvester "Bucky" Nash, told the Observer, "I wouldn't be opposed to everybody getting in a room and airing it out. Let's roll." 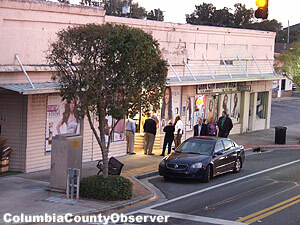 COLUMBIA COUNTY/LAKE CITY, FL – Everybody is entitled to their opinion, but it is good when it is based on reality. 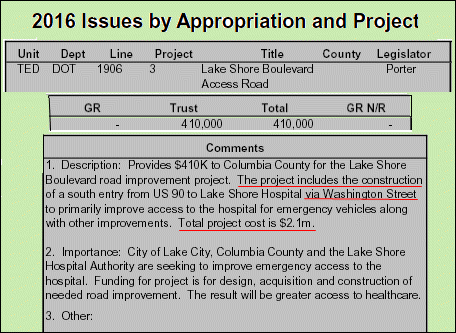 The Lake City Reporter besides "misreporting" Thursday's Board-Blanche vote, which was a heartbeat away from having The 5 deep-six the Blanche/IDP/Johnson Downtown Project, got the reason wrong why City Manager Johnson attended the County 5's Thursday board meeting and ignored how he came to address The 5. 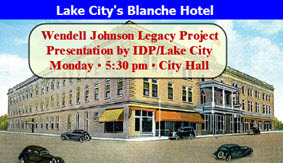 COLUMBIA COUNTY/LAKE CITY, FL – After the first 30 minutes of Thursday evening's Blanche discussion, the proposed Letter of Intent between IDP, Lake City, and Columbia County to renovate Lake City's downtown Blanche Hotel was balancing on a precipice. Commissioners Williams and Nash were in favor of at least giving the City a million dollar loan. Commissioners DePratter and Frisina were opposed. Commissioner Everett Phillips was on the fence. COLUMBIA COUNTY, FL – It was a rough ride for Lake City's Blanche Hotel last night as the County 5 met to discuss the Blanche Redevelopment Proposal of Valdosta's Integrity Development Partners (IDP). Seven and a half months of secrecy, backroom dealing, lobbying, and discussions culminated last night in confusion, charges, and counter-charges. 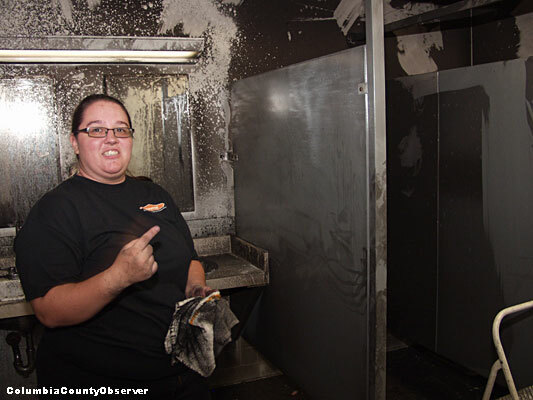 When the dust settled, folks were headed back to the drawing board for what appears to be the Blanche's last stand. The Blanche Tonight: Will Wendell Johnson's $17 mil Lake City Legacy Survive the County 5? COLUMBIA COUNTY, FL – Tonight, after multitudinous meetings with the Assistant County Manager, Ben Scott, and County Economic Development Director, Glenn Hunter, Columbia County's infamous County 5 will decide whether or not to front Lake City at least a million dollars on the derelict Blanche Hotel. 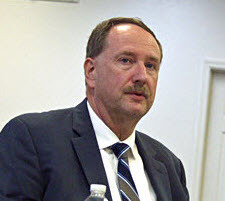 Secrecy and secret finances were a hallmark of City Manager Wendell Johnson's time at the now mostly defunct dismal failure, the $30 mil North Florida Broadband Authority, of which he was one of the financial kingpins. Johnson now is the driving force in Lake City's Blanche project, one that has ballooned from $13.5 mil to $17 mil in seven months. LAKE CITY, FL – Local financial practice, Gulf Coast Financial Services, Inc. (Gulf Coast), was recently awarded Small Business of the Year by the Lake City-Columbia County Chamber of Commerce. Blanche Hotel Developer Equity Skyrockets 850%: What is The Real Investment? LAKE CITY, FL – At Monday night's City Council meeting, the Blanche Hotel was again front and center. City Manager Wendell Johnson told the City Council, "This is not a $17 million taxpayer project. This is a $17 million construction project, which will be funded at about 50-50 from available government funds. They're (Integrity Development Partners "IDP" – the developer) gonna' come to the table with $1.7 million of their own equity." In September 2014, developer equity was "approximately $200,000." The seven month increase is 850%. No one is explaining the numbers behind the increase. LAKE CITY, FL – City Manager Wendell Johnson was a kingpin in the $30,000,000 North Florida Broadband Authority debacle, which he abandoned at the 12th hour. Now he is the prime negotiator in the Blanche Hotel downtown renovation. Seven months ago, in September 2014, the IDP – Wendell Johnson Blanche renovation was slated to cost $13,675,000. The price tag is now $17,000,000. 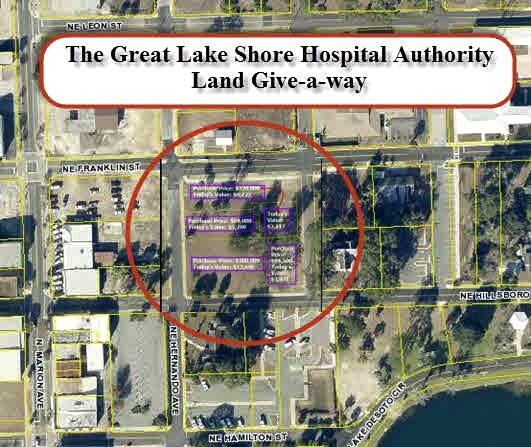 COLUMBIA COUNTY/LAKE CITY, FL – Beginning in 2009, the Lake Shore Hospital Authority's Jackson P. "Jack" Berry and Lake City's, City Manager Wendell Johnson have turned a blind eye to the plight of the handicapped on the Lake Shore Hospital Authority campus in downtown Lake City. The Authority Headquarters has missed the accessibility mark for years. In 2009, City Manager Johnson told the Observer ADA accessibility/compliance was not the City's responsibility and that if your reporter had a problem, "You should find someone in a wheel chair and have them sue," he said. LAKE CITY, FL – Last night in City Hall, the Community Redevelopment Advisory Committee met to accept the 2014 CRA financial report and listen to City Manager Wendell Johnson discuss the three major issues confronting the CRA: the land give-away from the Lake Shore Hospital Authority; the $1.2 mil CRA loan; and the Blanche Hotel. Most of the substantive discussion was about the $14,000,000 Blanche Hotel Project. LAKE CITY, FL – The long-awaited arrival of the Blanche Hotel train of advisors and consultants finally pulled into Lake City, City Hall last night. They played to a full house of residents, business owners, downtown property owners, and City and County officials. There were oohs – ahs and lots of hyperbole. It was a two-man show of City Manager Johnson and IDP's President Rhett Holmes. There were lots of pretty drawings. City Manager Johnson left the financing shrouded in mystery, telling the audience, "No details tonight will be conveyed." 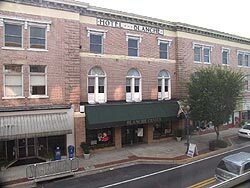 LAKE CITY, FL – City Manager Wendell Johnson and others have claimed that the future of downtown Lake City rests with the renovation of the Blanche Hotel, a City landmark that had fallen on hard times years ago. It was ignored by the City and City management, including City Manager Johnson until the Observer exposed that it had turned into a death trap. LAKE CITY, FL – Tuesday night saw the City Council unanimously approve the first step in securing a $1,200,000 loan to improve downtown Lake City. Florida statutes require the City Council approve the loan twice. Mayor Witt was the only Council member who commented on the loan. City Manager Wendell Johnson, who many believe is making the downtown renovation his legacy, asked the Council if they understood what the loan was going to do for the City over the next 15 years. 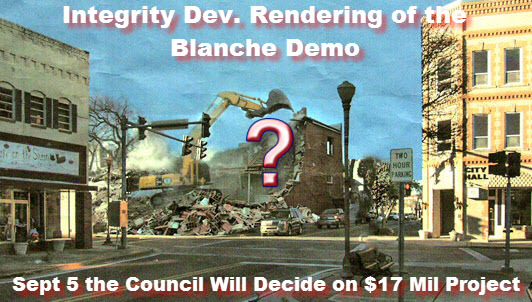 Blanche $15 mil Renovation: CM Johnson Playing it Close to the Vest, "You'll know when I know"
LAKE CITY, FL – The Lake City, City Council breezed through Monday evening's meeting agenda in a speedy 16 minutes. 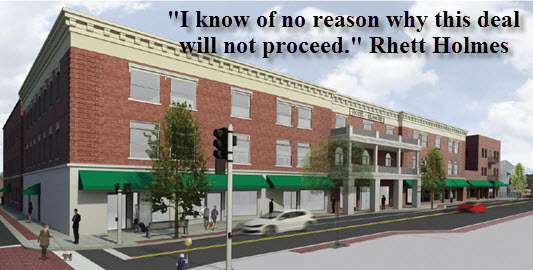 Resident Ralph Kitchens came to the Council for an update on the $15,000,000 Blanche Hotel renovation, of which there has been nothing new since the last Blanche meeting of the handpicked "Grassroots Blanche Stakeholder Committee" on December 16, 2014.